Boulder Primary School has just begun a partnership with WANSLEA. WANSLEA helps to assist schools such as ours to provide wrap around services for parents with children aged 0-5. This provides a one stop shop where parents can access a wider variety of support services. Peta, our School Chaplain, offers support for the emotional wellbeing of students, schools and their communities. Available every Tuesday and Thursday, our chaplain’s services aim to support families, increase the resilience of children and strengthen links between the school and wider community. Our Chaplain is also well positioned to support the spiritual, social and emotional wellbeing of teachers and the wider school community. Occupational therapy supports people to do the things they want and need to do everyday. At school this includes learning, using objects and technology, interacting with others, and looking after yourself. 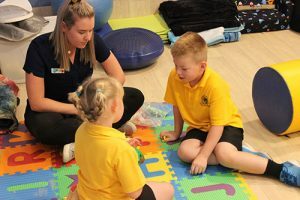 Sarah, our Occupational Therapist, works with the school team to make changes to the environment, task, or the equipment used, and support the student to learn and practice new skills. This is targeted to our Junior students. Sarah works at Boulder PS every Wednesday and is based in the sensory room. Marlene, our Speech Pathologist, identifies students in Early Childhood who may have difficulty with their speech and articulation. This is an important role in the school as these difficulties may lead to problems in Literacy development. Marlene also provides advice and support to teachers and Education Assistants in regards to strategies that they can use in class to improve the language acquisition of our students. Marlene works on site on Wednesdays. Kate Pascho is a provisionally registered School Psychologist who works with students on Wednesdays. Kate is utilised to provide advice and guidance to teachers to help students engage and understand the curriculum. She is able to provide assessments to see if there are any learning difficulties and if so, refer those students to other specialists for additional support. Kate also assists in the development of Individual Educational Plans and Individual Behaviour Plans for students who don’t participate in class. Jessica is a Registered Nurse who works on site on Thursdays. She provides early intervention to screen for ear and eye issues in students in Kindergarten and Pre Primary. Jessica also helps with other students where concerns may present about their physical health and wellbeing.